Philippine Airlines (PAL) is planning to launch services to London in early Nov-2013, the first step in an ambitious plan for resuming flights to Europe. PAL has secured Heathrow slots but the flight times are not ideal as they do not support connecting services, which the carrier will likely need to sustain the new route. PAL will face intense competition from several carriers in the Manila-London market as well as in planned new services to continental Europe. While PAL will be the only airline offering non-stop service between the Philippines and Europe, the market is well served on a one-stop basis by several Asian and Gulf carriers. PAL announced on 17-Sep-2013 that London Heathrow will be its first European destination since 1998 with flights beginning on 4-Nov-2013. The Manila-London Heathrow route will initially be served with five weekly frequencies using 777-300ERs. The announcement, made in Manila by PAL CEO Ramon Ang and British Minister of State for Trade and Investment Lord Stephen Green of Hurstpierpoint, comes a few months after the EU lifted PAL from its black list of banned carriers. Mr Ang initially signalled intentions to launch at least four European routes over the next several months at a Jul-2013 event with the EU Ambassador to the Philippines. In addition to London, PAL has been looking at Amsterdam, Frankfurt, Paris and Rome. The carrier is aiming to launch a second European destination by the end of 2013 followed by further expansion in 2014. PAL hopes to attract the Filipino community in the UK as well as support efforts to boost inbound tourism from the UK. The Philippines attracted 60,000 visitors from the UK in 1H2013, a relatively small number but a new direct flight and the Philippines emergence as a major tourism destination should boost numbers. "With PAL's new non-stop flights, we are sure these numbers will rise even further," said Mr. Ang. The UK has one of the 10 largest overseas Filipino populations, numbering approximately 200,000. PAL’s selection of London as its first European destination is no surprise as the UK has the largest Filipino population in Europe. London is also the largest origin and destination market in Europe for Manila, with over 250,000 roundtrip passengers in 2012. Cathay Pacific, Etihad and Singapore Airlines are the three largest carriers in the market, based on O&D data from 2012. PAL will also have to overcome competition from several other airlines with one-stop products including Emirates, Qatar Airways, Malaysia Airlines and Thai Airways. Royal Brunei also offers a very competitive two-stop product from Manila to Heathrow via Brunei and Dubai. PAL is banking on the convenience of non-stop flights to attract passengers. But as in the case with most Southeast Asia-Europe routes, Manila-London is very competitive with the Gulf carriers particularly aggressive. The major Asian flag carriers and the Gulf carriers have more established brands in Europe and offer leading premium products along with strong loyalty programmes. PAL also has a very short window, just seven weeks, to market the new service. This is particularly challenging given the carrier has not been in the European market for 15 years. Its current network does not come even near Europe – PAL does not currently serve any destination in South Asia, the Middle East or Africa although it is planning to resume service to the Middle East. Toronto is its only destination in eastern North America. Toronto, which was launched at the end of Nov-2012 with a similar short period between the start of ticket sales and the first flight, has had a rough start. Non-stops on the outbound leg were quickly dropped. For now the route continues to be served three times per week via Vancouver in both directions although a couple of months ago it appeared Toronto was going to get the axe due to poor performance. The experience PAL has had in Toronto, which has so far been the only long-haul route added since Mr Ang's San Miguel Group took over in 1H2012, highlight the risky nature of long-haul expansion. PAL has the aircraft to launch non-stop services to Europe as its new fleet of 777-300ERs are not being fully utilised because restrictions continue to prevent the carrier from adding flights or changing gauge on existing flights to the US. The 777-300ER fleet was originally acquired for the US market but so far PAL has only used the new type for long-range flights to Canada and shorter flights within Asia-Pacific including Australia due to US FAA Category 2 restrictions. Philippine authorities are now optimistic the FAA will upgrade the Philippines to a Category 1 safety rating within the next few months, which will enable PAL to start using 777-300ERs on US routes and launch new US destinations, potentially New York and San Diego. Other Philippine carriers including LCC Cebu Pacific, which recently launched a medium/long-haul unit with A330-300s, would also be able to launch services to the US once Category 1 is restored. But an upgrade to Category 1 could take several months or more and in the meantime PAL is keen to more effectively use its 777-300ERs. It currently operates five of the type with one more to be delivered by the end of 2013. PAL also acquired earlier this year four ex-Iberia A340-300s, which could also be used to operate some of the carrier’s new European routes. PAL already had a fleet of four older A340-300s which are used on its US routes along with five ageing 747-400s. These aircraft will likely be phased out once Category 1 is achieved. PAL currently serves Los Angeles and San Francisco in the mainland US as well as Hawaii and Guam. The Guam flights are operated with A320s while the other three routes are served with widebody aircraft. The US is PAL’s biggest long-haul market and generally has been its most profitable as the carrier has been facing intensifying competition from LCCs on regional international routes. 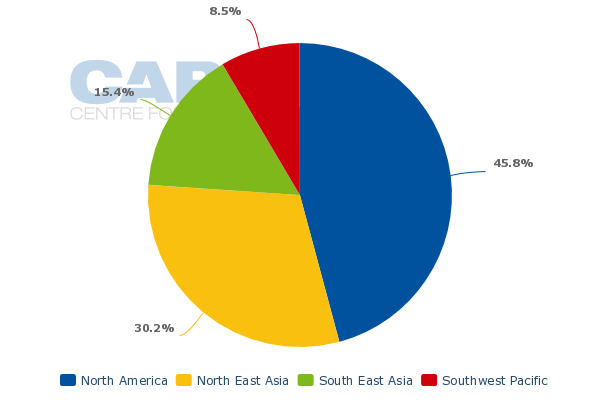 North America currently accounts for nearly half of PAL’s international ASK and about 16% of its seats. In North America PAL also serves Vancouver with some flights continuing onto Toronto. The US has by far the largest population of overseas Filipinos and PAL is the only non-stop carrier in the Philippines-US market. Delta serves Manila but via Tokyo and Nagoya while PAL also competes with several North Asian carriers in the Philippines-US market. PAL is hoping to exploit a similar advantage in the Philippines-Europe market but will face a larger set of competitors and a much smaller local market. The UK and continental Europe have sizeable Filipino populations but all of Europe combined has less than 700,000 Filipinos compared to over 3 million in the US. PAL now has multiple destinations in the US but it is planning to have approximately the same number of destinations in Europe despite the US having four times as many Filipinos. In the Philippines-US market PAL does not have to compete with all the Gulf carriers. Emirates, Etihad and Qatar Airways all serve Manila with multiple daily flights. Emirates, with three daily flights, is currently the third largest foreign carrier at Manila after Cathay Pacific and Singapore Airlines. Etihad is the seventh largest. Emirates and Qatar are also both launching serving in Oct-2013 to Manila alternative airport Clark, where the carriers are taking advantage of open skies as there is no room in the bilateral for more flights from their hubs to Manila International. The Gulf carriers typically offer very competitive fares between Southeast Asia and Europe and also offer a wide range of destinations in Europe, giving passengers more options. PAL’s ambitious European expansion could prove to be overly ambitious given the intense competition with the Gulf carriers and the small size of some of the local markets it is planning to enter. London is only big enough if PAL is successful at attracting a majority of the local traffic away from the carriers now offering competitive one-stop product. The other potential European routes – Amsterdam, Frankfurt, Rome and Paris – are one fifth to one third the size of Manila-London on a local O&D basis, providing even bigger challenges. Expansion in the US, if it finally becomes an option, could prove to be a safer bet. If the Philippines does succeed at securing a Category 1 safety rating, PAL may quickly revisit its expansion plans for Europe and instead deploy additional capacity to Honolulu, Los Angeles and San Francisco as well as new US destinations. London will also prove challenging as PAL will need to rely on connecting traffic to make the new route work, particularly given the intense competition in the Manila-London market. PAL has an advantage over other carriers in the Philippines-Europe market in that it is able to offer domestic connections throughout the Philippines. This is particularly important as most of the country’s more popular tourist destinations can only be accessed via smaller domestic airports. But the timing of the London flight limits the number of domestic connections on the outbound sector as it leaves Manila in the early morning (about 0800), arriving in London in the afternoon. For example, the first PAL Express flight from Caticlan, the gateway to the popular tourist island of Borocay lands at Manila at 0820. The first flight from Puerto Princesa on Palawan, another popular island, lands in Manila at 0945. Only on big trunk routes such as Cebu and Davao are connecting flights available. The return flights are more suitable for connections as they depart London in the early evening, arriving back in Manila the following afternoon. But by only offering connections in one direction PAL limits its options as it tries to fill up a 370-seat aircraft. International connections will be even more limited. PAL’s Melbourne and Sydney flights arrive in Manila in the late afternoon. And none of the carrier’s regional international destinations have early morning arrivals in Manila. With the right flight times, PAL could have targeted the Australia-London market. The kangaroo route is very competitive but also very large. Typically new carriers in the Asia-London market dip into the Australia-London market to help fill up the additional capacity, particularly during the initial phases. Mainland Chinese carriers in recent years have been the latest to aggressively pursue Australia-Europe traffic to help fill expanded capacity to both Australia and Europe. Garuda Indonesia has also started targeting Australia-London traffic ahead of its launch of services to London. Garuda was initially planning to launch services to London on 2-Nov-2013, which would have beat the PAL launch by two days. But after selling the new service for several months Garuda in late Jul-2013 pushed back its London launch by six months to May-2014, citing airport infrastructure issues in Jakarta. Garuda still plans to offer same plane service from Sydney to London, using its new fleet of 777-300ERs, once London is finally launched. Garuda has taken delivery of two 777-300ERs in recent months and has six more on order, with two more to be delivered by the end of 2013 and the remaining six to be delivered in 2014 and 2015. Like PAL, Garuda plans to initially serve London with five weekly flights, followed by other European destinations in 2014, starting with Paris. But it has a different schedule for London which maximises domestic and international connections, including to and from multiple destinations in Australia. Garuda’s planned London flight leaves Jakarta after midnight, allowing for connections, and arrives in London at 0830. The return flight leaves London at 1000 arriving back in Jakarta early the following morning, again allowing for connections. Garuda also had tried to acquire slots at London Heathrow, which is its preferred London airport. But the carrier settled on Gatwick as it could not find slots at the hours it needed to support connections in Jakarta. PAL was faced with the same choices but chose to go with Heathrow over Gatwick despite compromising on connections. It is not an easy decision. Gatwick could make the route hard to pull off, particularly for business passengers. (Garuda is targeting the business market with lie flat business class seats and a first class cabin on its 777-300ERs, marking the return of a first class product.) But connections are absolutely essential to make a new London service viable. The Jakarta-London market is not big enough, at least not at this stage, to sustain the service without connections. Domestic connections, particularly to Bali and other holiday destinations in Indonesia, as well as Australia are essential. The Manila-London market may be larger as there is a larger Filipino community than Indonesian community in the UK, but PAL is taking a big gamble in trying to operate the route without a wide range of connections on the Manila end for the outbound leg. Vietnam Airlines in Apr-2013 added a Frankfurt stop on all its flights to and from London while increasing frequency to five per week. The carrier currently operates three weekly 777 flights from Ho Chi Minh via Frankfurt and two weekly 777 flights from Hanoi via Frankfurt. The Frankfurt stop is a setback as the carrier is unable to offer a one-stop product to London from other Asian destinations or Australia. It shows the challenges involved with expanding long-haul operations. PAL for now plans to serve Frankfurt as a separate flight but inevitably it will experience the same challenges that confronted Vietnam Airlines. The PAL timings at Heathrow are suitable for connections on the London end. But backtracking via congested Heathrow to continental Europe is not an appealing option. A one-stop product to the same European destinations on Gulf carriers is more attractive. PAL also plans to launch non-stop services to at least a couple of continental European destinations, where connections within Europe will be easier to pursue and will also be critical given the small size of each potential city pair. PAL also lacks partner carriers. It does not currently have codeshares with any European carriers. PAL is also the only major Southeast Asian flag carrier that is not in a global alliance or is in the process of joining an alliance. Garuda will formally join SkyTeam in Mar-2014 while SIA (Star), Thai Airways (Star), MAS (oneworld) and Vietnam Airlines (SkyTeam) are already alliance members. PAL could seek to join an alliance but interest will likely be limited as all the alliances now have sufficient coverage of Southeast Asia. 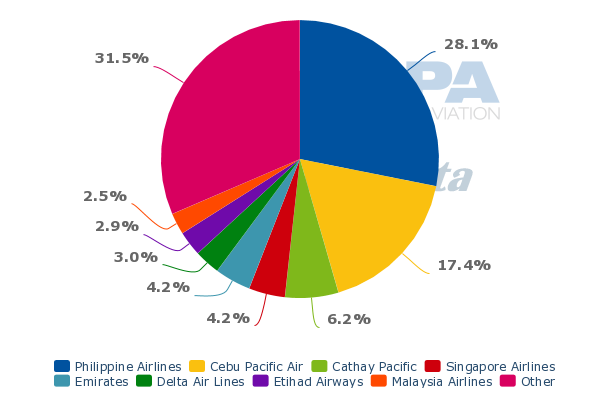 PAL’s network would add little with the exception of secondary cities in the Philippines and its long-haul expansion is not synergistic as it overlaps with other alliance members. As is the case with Garuda, PAL is making a huge and risky investment in expanding into the European market. Competition is fierce and current market conditions in Europe are not entirely favourable. But making money in the London market can be challenging, especially with an unknown brand. PAL will have its work cut out for it as it enters London Heathrow and subsequently launches services to continental Europe.